We invite you to explore India - the Land with infinite beauty ! Whether you soar high into Himalayas or peer under the ruins of the Ancient monuments dotting the landscape of India, you will cherish the experience long after your visit ! This India Travel Guide on Fort St Angelo Kannur is free from any commercial interest! This site is dedicated to promote India - the vast subcontinent, its glorious past, magnificent landscape and its infinite variety. Kannur on the north coastline of Kerala boasts of virgin beaches at Meenkunnu, Payyambalam and Kizhunna. It has always been a prominent location for spice trade, for centuries. This brought many European powers and Arabs here. You can get an idea of the influence middle east had in this part of Kerala - by the name of the nearby bay - Mapilla Bay. A visitor to Kannur and Thalassery can take in the many churches and temples built here. You can find demonstration of the ancient art form of Theyyam. Don't miss the Snake Park and its attractions. Taking pride of place amongst them all is the ancient St. Angelo Fort built in the Kannur Cantonment. Trekking enthusiasts will find Pythal Mala, along the Kerala - Karnataka border enjoyable. 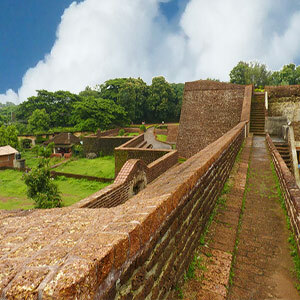 The St. Angelo fort is one of the oldest forts in Kerala. It was built in 1505 by Dom Francisco de Almeida , a Portuguese explorer and soldier. Francisco de Almeida, as the Viceroy of India was instrumental in establishing the Portuguese colonial base in India - along with Afonso de Albuquerque . He established 4 forts in the West coast of India - namely St.Angelo Fort in Cannanore (now known as Kannur), Fort Anjediva, Cochin Fort and one in Quilon. The Arabs - under Sultanate of Egypt, combined with the forces of Ottoman and Sultan of Gujarat along with the Zamorin of Calicut were defeated by Francisco de Almeida in a naval battle - thus establishing the supremacy of the western powers in this part of the world. Fort St.Angelo - named after the martyred Catholic Saint of the Carmelite Order, is a testimony to the thoroughness of the Europeans - use of the right material and appropriate construction techniques - that it had survived the ravages of time and war for the past 500 years. It was later captured by the Dutch in 1663. The bastions Hollandia, Zeelandia and Frieslandia can be seen here. In fact, you can find a painting of this fort is the Rijksmuseum in Amsterdam. This fort was prominent as a British Military base after they captured it from the Dutch in 1790. 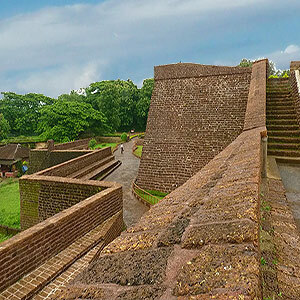 This massive fort was built in laterite in a triangular style, with a moat and flanking bastions. The St. Angelo fort was later modified by the British who also added additional structures and it was made an important naval base for the British. You can still find the canons placed in various towers. It is today a protected monument under the Archaeological Survey of India. St. Angelo fort attracts a large number of tourists every year because of its natural fishing bay also known as the Moppila Bay which has been modified into a harbor. You can easily travel to Kannur by road or train from Mangalore, Kochi, Bangalore, Coimbatore, Coorg and Kozhikode. Kannur station is barely 3 kilometers away and the nearest airport is about 93 kilometers in Kozhikode. The Fort also hosts events and shows for tourists and traditional programs showcasing Kerala culture. Tourists can also visit Dharmadom Island, about 100 mts away from the mainland. If you are staying in Kannur for a couple of days, take time off to visit the Aralam Wildlife Sanctuary near Iritty. A picturesque spot at nearly 1145 m, Muzhakkanu is ideal for a picnic. The green slopes of the mountains are home to leopards, bison, elephants, deer and boar. Arakkal Museum : Visitors to Kannur can also see the Arakkal Museum, housing sections of the Arakkal Kottaram or palace of the local Muslim royal family. It houses various artifacts and rare pieces of art. Dharmadam Island : Dharmadam is a small island surrounded by the Anjarakandy River on three sides and by the Arabian Sea on the other. Lush with coconut palms and vegetation, Dharamdam can be accessed during low tide by walking across. Juxtaposed with red-brown rocks, this verdant vegetation is picturesque. Seek prior permission before venturing here. The clean stretch of Muzhappilangad Drive-In beach is ideal for tourists. Winding through coconut plantations, this stretch offers relaxing tranquil atmosphere. You can take your vehicle all the way down to the sea sand. This is probably one of Kannur's best kept secrets. Hardly 20 km from Kannur is Thalassery, once a military center of the British. Here you can find the Thalaserry Fort built on a small hill Tiruvellapadkunnu in 1700. This structure was also built of laterite, square building with flanking bastions and huge carved doors. It has secret tunnels leading to the sea and is now a historic monument. You can also see the St. John's Anglican Church and cemetery nearby. In Thalassery, you can find the 200 year old Garden Mosque or Odathil Palli. With copper plate roofs and golden dome, this mosque is a beautiful sight. The Thiruvangad Sree Ramaswami Temple here is said to be nearly 400 years old with rich carvings.